Time to showcase another lovely outfits that I’ve recently acquired! This is this gorgeous custom set called “Your Royal Highness” created by Puppy52! I fell in love with the gorgeous print of the skirt and knew that I had to have this set – and most of the pieces are sized for the DDdy/DDdy3 body, which can be hard to find clothing for. 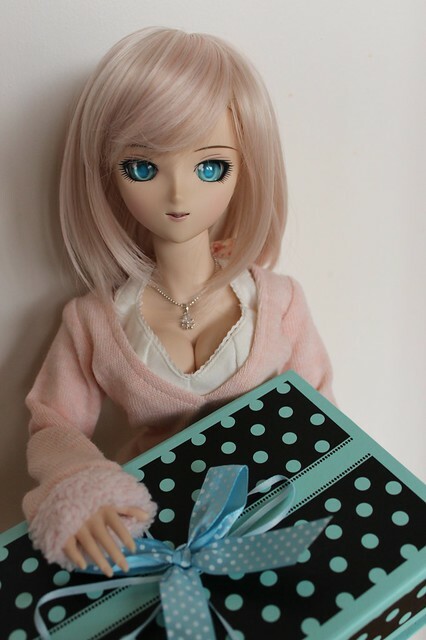 It arrived in a beautiful box and Hinata was very excited to receive this present! What can be inside? Puppy52 knew that this would be a gift for Hinata (since she’s my only DDdy! Hehehe!) and drew this beautiful picture of her! It’s so gorgeous!! *___* Thank you! I love how the jeans hug the DDdy3’s curves! Puppy52 omitted the belt loops on these capri jeans so there is less bulk at the waistband when tops are worn loosely over top of them. There are so many pieces that Hinata would look a bit silly wearing them all at once, so Serena is here to help model too! 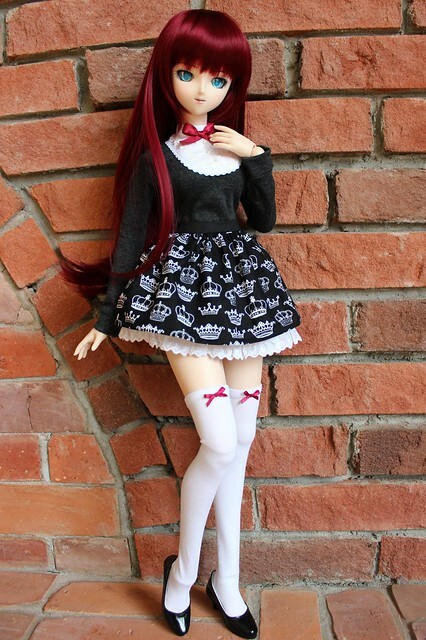 This skirt is designed to fit on all Dollfie Dream body types and it’s so pretty! Hinata couldn’t let Serena walk away with it, so here she is modelling it with some cute coordinating stockings. 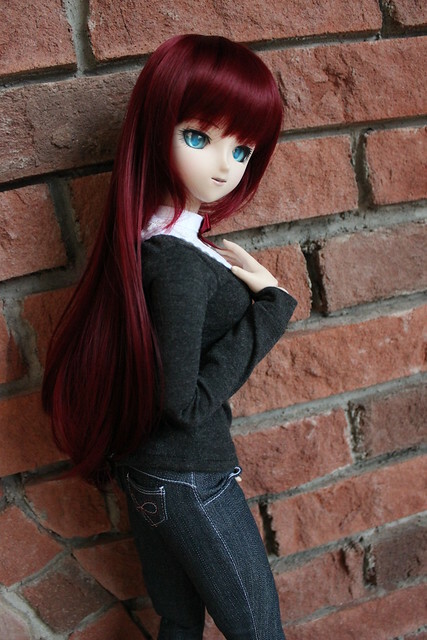 Hinata is showing off a beautiful ‘Red Wine’ coloured wig to coordinate with this outfit set – do you like it on her? I’m thrilled to own this beautiful set! Puppy52 has just listed a new one-off set for sale as well – details are on her blog. If you like it, please support her wonderful work! 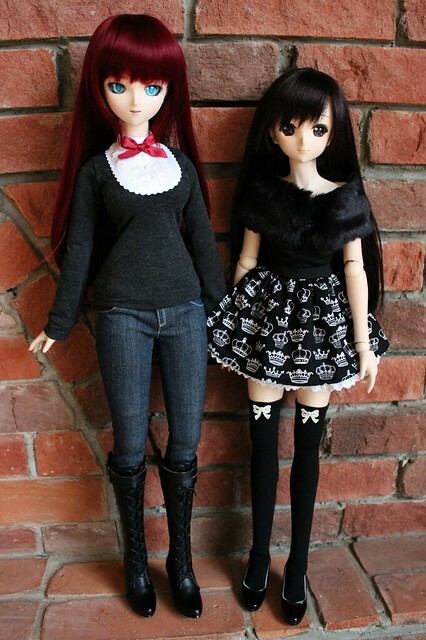 This entry was posted in Dollfie Dream and tagged Aerie, Dollfie Dream, Hinata, Lily, Serena, Yuki Morikawa by archangeli. Bookmark the permalink. I love the darker colour scheme, and even thought his was mostly a treat for Hinata, it’s great that some pieces can be worn by my other girls too! 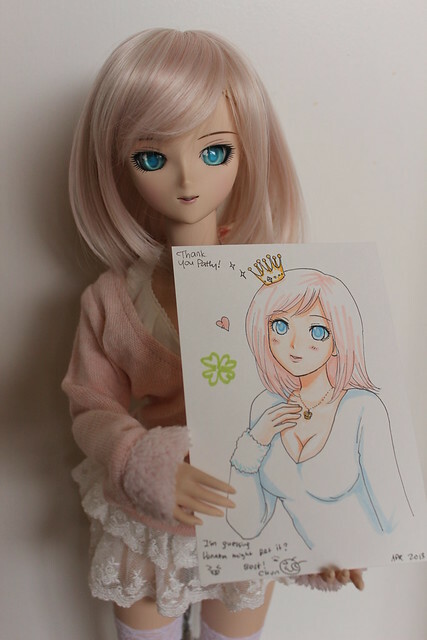 So sweet they drew you a drawing of your princess. Us girls should meet our dolls sometime.